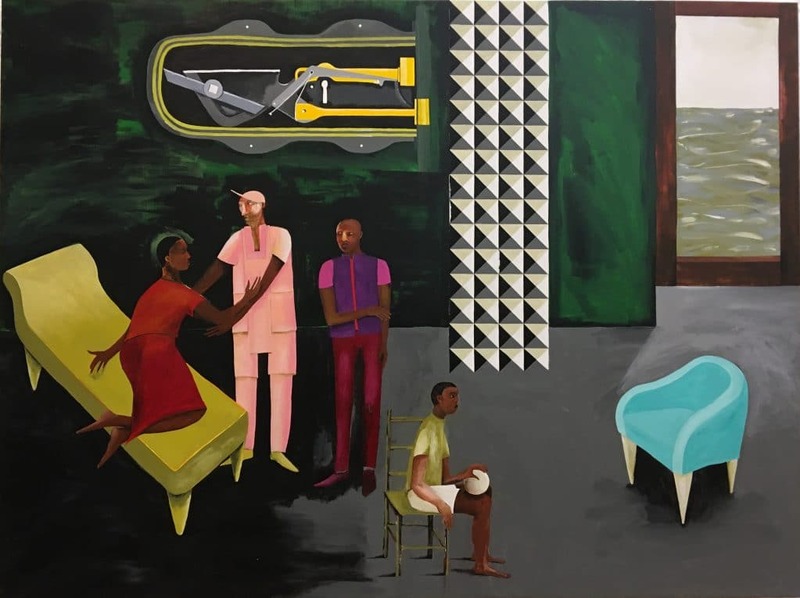 Lubaina Himid trained as a theatre set designer but emerged as a visual artist in association with the British Black Arts Movement in the 1980s, making work and organising exhibitions by her peers. Though predominantly a painter, she utilises a range of materials in her work, which engages in themes around black identity, black history – particularly the history of the transatlantic slave trade – media representation of celebrities in the media, and migration. 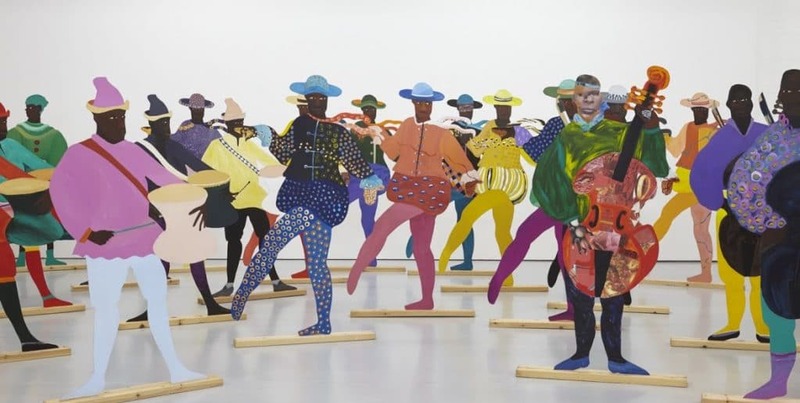 Himid currently has two solo shows running concurrently, ‘Invisible Strategies’ at Modern Art Oxford, and ‘Navigation Charts’ at Spike Island, Bristol. She’s also included in Nottingham Contemporary’s ‘The Place is Here’, a group exhibition of black artists who emerged in the 1980s which opens 4 February. Included in ‘The Place is Here’ is her large-scale painting A Fashionable Marriage, which is inspired by William Hogarth’s series Marriage-a-la-mode and features Margaret Thatcher and Ronald Reagan as Hogarth’s lascivious Countess and Silvertongue. 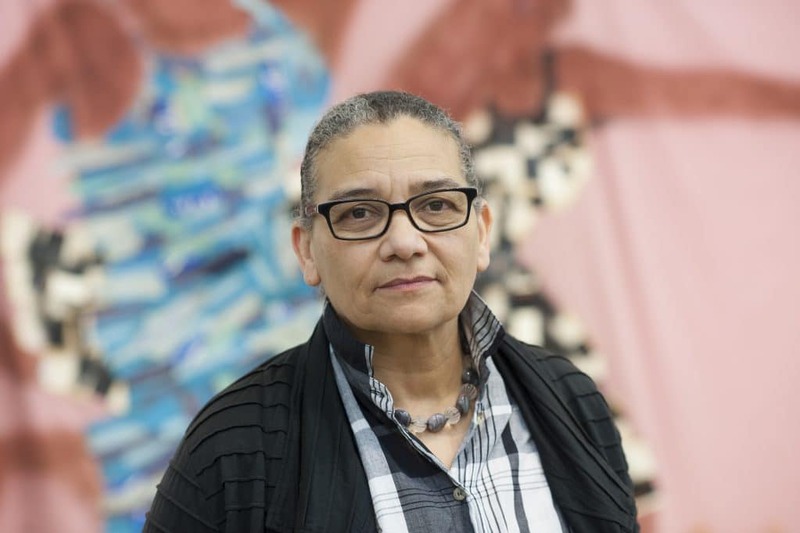 In addition to her artistic practice Himid is a professor of contemporary art at the University of Central Lancashire, Preston where she leads a visual art research project, Making Histories Visible, which critically explores the work and impact of the Black Arts Movement. Your solo shows at Spike island and Modern Art Oxford draw on different aspects of your work. Can you tell us more. At Spike Island, I was trying to make a show that’s distinctly about movement, about migration and journeys, and to make a space about those conversations that we have with our past and, I suppose, our real selves. So the main work is Naming the Money. This consists of 100 painted cut-out figures, representing a gathering of slave-servants of the 18th and 19th centuries, figures you might normally see in the background or somewhere in the shadows in an oil painting featuring aristocrats and who are there to signify great wealth. Each of these people have a name, which is their own name, in addition to the name that’s given to them. And they have a past and an identity and a task that they’re assigned to do. So they become visible. At Modern Art Oxford there’s a bigger span of work. 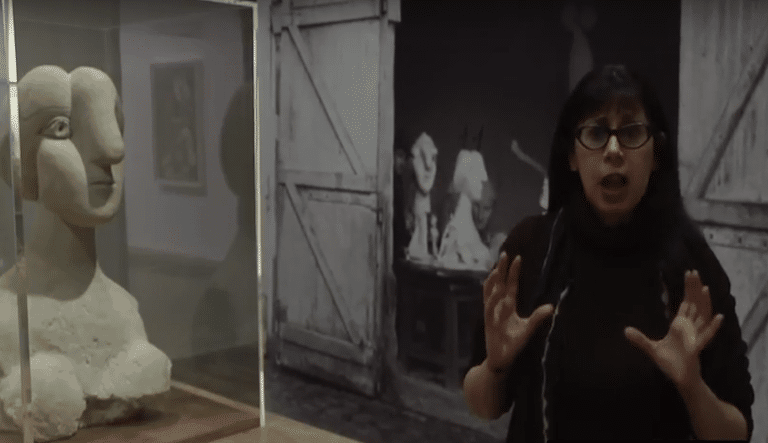 So we go from very early work, like the painting Freedom and Change, from 1984, which is taken from a Picasso painting [Two Women Running on the Beach, 1922], right up to paintings that I made last summer. And I’m showing the Guardian archive series where I overpainted pages from the Guardian, presenting a critique of the depiction of black celebrities and athletes over the course of a year. There’s also the Lancaster Dinner Service, where I’ve overpainted old ceramics to make a critique of the ambivalent attitude to the bicentenary (in 2007) of the abolition of the British slave trade. Some of your work in Oxford is directly autobiographical. Is your own family history something you explore quite a lot in your work? Not really. There’s just one series, Zanzibar, that really is the most direct and personal piece of work I’ve made, which is a series of paintings about going back to Zanzibar, where I was born but which I left when I was very young. Other works might have my personal life threaded through them but they’re much more about the political impact upon the person. You left Zanzibar when you were just four months old in 1954 and only returned four decades later, and the series was in response to that visit. What did it feel like to go back? It was like home, I suppose. I’d spent time in places like Cuba, Havana, Matanzas, going to places heavily affected by cross-cultural trading and which have multiple communities. And I’ve lived in London for 30-odd years, so I think I understood what Zanzibar was, and when I got there it felt familiar. I’d also read a a lot about it, its politics, its history, its architecture. I’m very much a British citizen, but when I got there I kind of felt at home. I think the first thing to say is that it wasn’t a collective. There was a black art group and that was one set of people, and there were lots of people who were connected to the Black Art Gallery, and there was a women’s art group, which I was closely involved with. I think it was incredibly important because we came from very different diasporan backgrounds, and so we didn’t belong in tight little groups. We made work that was very different from each other, and we had different things to say about our experiences of being here. We respected our different ways of interpreting the experience of being black in the 1980s. That was the strength of it. What do you think gave this particular generation of black artists – who was largely, though not exclusively, second generation immigrants to the UK – its political impetus? I suppose in the 1980s we were largely invisible. Black people were virtually invisible in every sphere. You didn’t see black people on television, in newspapers, doing normal things. Culturally we were just invisible, so we were absolutely determined to make ourselves visible in that way. And we were subject to extraordinary political pressure. There was the National Front, Enoch Powell, Margaret Thatcher and her pro-Apartheid stance. There were times in which you knew as a black person that you really were not considered very important, either culturally, or economically, or intellectually. And I suppose we decided that we didn’t want to put up with it. It sounds like there was an incredible energy propelling you forward. That must have been an exciting time. I suppose it was exciting, but it was very challenging. We were up against a British establishment that didn’t particularly want change. The ’80s were a very charmed time for many people in Britain. To try to challenge that was difficult, but it was more difficult if you were trying to walk down the street without getting stopped and searched. It was a slog, a real slog, and I think we thought it would change quicker. We didn’t have grants and we didn’t drive cars, so transporting stuff from A to B was challenging. I mean, putting on exhibitions is fabulous when you’ve done it, but it’s a slog to get it done. But, yes, looking back, it was quite exciting to see quite a few of the threads coming together. People were trying to influence television, the law, so many other things as well, and it kind of came together. Quite a few of us still work together. Your background in theatre design has clearly informed the way you work, at least in a formal sense. But how useful have you found this background in giving your work its political bite? I think politically not at all. I mean, British theatre in the 1970s when I was studying theatre design was not particularly political. So it didn’t really have any influence on the politics of what I do. I wanted theatre to be more like the work I make now. I wanted it to be an influential force. But I did get to understand the history of cultures, in a way that you don’t with a fine art education. I mean, setting a play in a different era than when it’s written means you have to study that whole era if you’re making costumes and sets, so in the process you learn in a much broader sense. And my desire for theatre to be more political influenced the way I work now.